All About Water - The Amazing Fluid We Take For Granted, Often Drink Too Little Of... But Can't Live Without! Without food we can live for weeks. But without water, depending on the temperature, we only would last a few days. Nothing survives without water, and virtually nothing takes place in the body without water playing a vital role. 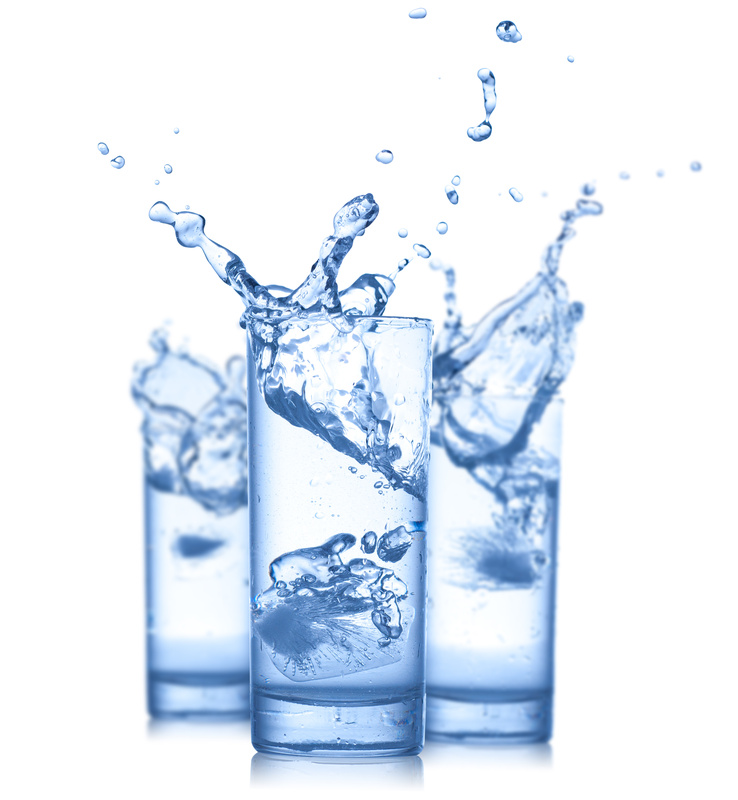 While variations may be great, the average adult’s body weight is generally made up of 50%-60% water. Men generally have more water than women, a lean person more than an obese person. Some parts of the body have more water than others. Human blood is about 92 percent water, muscle and the brain about 75 percent, and bone 22 percent. Water carries nutrients to the cells and carries away waste materials via the kidneys. Water is needed in each step of the process of converting food into energy and tissue. Water in the digestive secretions softens, dilutes, and liquefies the food to facilitate digestion. It also helps move food along the gastrointestinal tract. Differences in the fluid concentration on either side of the intestinal wall enhance the absorption process. Water serves as an important part of lubricants, helping to cushion the joints and internal organs, keeping body tissues such as the eyes, lungs, and air passages moist, and surrounding and protecting the fetus during pregnancy. Besides drinking fluid, nearly all foods have some water. Milk, for example, is about 87 percent water, eggs about 75%, meat between 40-75%, vegetables from 70-95%, cereals from 8-20%, and bread around 35%. The body gets rid of the water it doesn’t need through the kidneys and skin and, to a lesser degree, from the lungs and gastrointestinal tract. Water is also excreted as urine by the kidneys along with waste materials carried from the cells. About 1-1.5 litres a day are excreted as urine. The amount of urine reflects, to some extent, the amount of fluid intake of the individual, although no matter how little water one consumes, the kidneys will always excrete a certain amount each day to eliminate waste products generated by the body’s metabolic actions. In addition to the urine, air released from the lungs contains some water, and evaporation that occurs on the skin (when sweating or not sweating) contains water as well. If normal and healthy, the body maintains water at a constant level. A number of mechanisms, including the sensation of thirst, operate to keep bodywater content within narrow limits. You feel thirsty when the blood starts to become too concentrated. Unfortunately, by the time you feel thirsty, you are already much in need of extra fluid, but this can be easily remedied by drinking promptly. It is therefore very important not to ignore feelings of thirst, a concern that is particularly appropriate for the elderly. 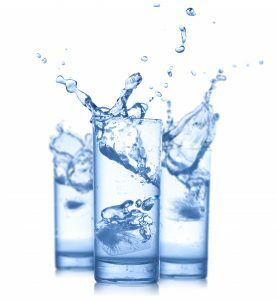 For healthy individuals it is not possible to drink too much water, it will simply be excreted. Every hour a healthy kidney at rest can excrete 800 to 1,000 ml of water and therefore a person can drink water at a rate of 800 to 1,000 ml per hour without experiencing a net gain in water. Excessive amounts of water over a short space of time, however, can overload the kidneys. There are, of course, conditions in which the various body mechanisms for regulating water balance do not work, such as severe vomiting, diarrhoea, excessive bleeding, high fever, burns, and excessive perspiration. In these situations, large amounts of fluids and minerals are lost. The treatment of these conditions are medical problems to be managed by a doctor. The body loses 1.5 litres of water a day through the skin, lungs and gut and via the kidneys as urine, ensuring that toxic substances are eliminated from the body. We also make about a third of a litre of water per day when glucose is “burnt” for energy. Therefore our minimum water intake from food and drink needs to be more than one litre a day. The ideal daily intake is around 2.5 litres. Alcohol, tea and coffee cause the body to lose water, so are not recommended as sources of fluid intake. They also rob the body of valuable minerals.